And the Academy Award goes to… Jonah Hill? Again? | Music or Space Shuttle? And the Academy Award goes to… Jonah Hill? Again? Jonah Hill received another Academy Award nomination this week for his supporting role in The Wolf of Wall Street. I guess this isn’t as much of a surprise as it was last time. 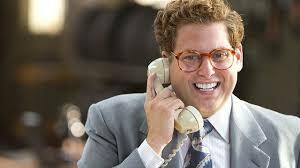 I havent seen The Wolf of Wall Street yet but from all reports I’ve heard Jonah was great in it. To commemorate his latest nomination, I thought I would share a couple more of Jonah’s past roles that I felt deserve some recognition as well. Jonah had a lot of great scenes in the movie This is the End, but my favorite is “The Exorcism of Jonah Hill.” Throughout most of the movie Jonah portrays himself as an easy-going sensitive guy even though he is secretly jealous of Jay Baruchel and his relationship with Seth Rogen. His jealousy leads to an unfortunate sexual encounter with a horned and horny demon. After the forced sodomization, Jonah becomes possessed and his true colors come out. This whole scene is just genius. Thank you Mr. Tarantino. A lynch mob, lead by another scene stealer Don Johnson, is getting ready to storm over a hill to murder the lead character Django. As the mob is about to leave, they get into an argument over the bags they are supposed to wear over their heads. Hurtful words are exchanged and feelings get hurt. My favorite part is at the 2:10 mark of this clip where one of the mob tries to smooth things over. Some coarse language here folks so be advised. Congratulations again to Jonah for being nominated for such a high profile acting award. I just hope he doesn’t go the route of other some other comedic actors and do only dramatic roles from now on. Robin Williams won his Oscar and all we saw from him afterwards was crap like Patch Adams and Jakob the Liar. Stay true to your comedic roots Jonah and we the fans will always ask you about your wiener.